Whether it's tableware that's brought out only for the holidays or an heirloom vase that sits safely on a high shelf, chances are you have pieces of fine porcelain in your home. 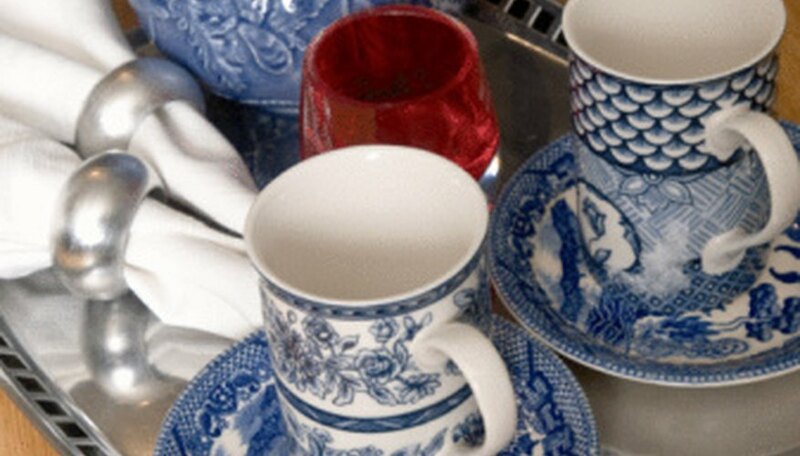 Chances are equally good that you know very little about your porcelain. Finding the maker of your piece may take some time and research, but the payoff is knowing more about something you cherish. And, you may even discover that you have a valuable treasure sitting in your china cabinet. Locate and examine the mark. Porcelain maker’s marks are usually located on the bottom or the backside of the piece. Examine the mark carefully. Use a magnifying glass to see the details. A mark is usually an ink stamp or an impression in the porcelain. The manufacturer’s name may be clearly printed in the mark. However, some companies use a symbol rather than a signature. Look for information in addition to the manufacturer’s name. The mark on a piece of porcelain often tells more than the maker’s name. You may find the artist's initials, symbol or signature. Also, if the piece was produced after 1891, the United States requires that all imported porcelain must have the country of origin stamped on it, near or within the maker’s mark. Compare the mark to Internet guides. Online guides to manufacturers’s marks show the illustrations for numerous porcelain trademarks. The guides also show if a maker had different markings during its history of manufacturing. Match your mark to what you find in a guide. This can tell you the name of the maker and when your piece was made. The website Antique Marks features more than 10,000 trademarks, as well as examples of products that bear the marks. Consult collectors’s books. Visit your local library or bookstore to find porcelain-collectors’s guidebooks. Use these books to compare the mark on your piece to those pictured. Look for guides such as “Kovels' New Dictionary of Marks: Pottery and Porcelain, 1850 to the Present” by Ralph Kovel and Terry Kovel; “Pictorial Guide to Pottery and Porcelain Marks” by Chad Lage; or “Lehner's Encyclopedia of U.S. Marks on Pottery, Porcelain Clay” by Lois Lehner. Get the help of a china-replacement company. If you've been unable to identify the maker’s mark on your own, free help is available. The china- and crystal-replacement service Replacement, Ltd., offers assistance in finding the maker of pieces of porcelain dinnerware. Send the company a picture of your piece via e-mail, regular mail, or fax for a free identification.